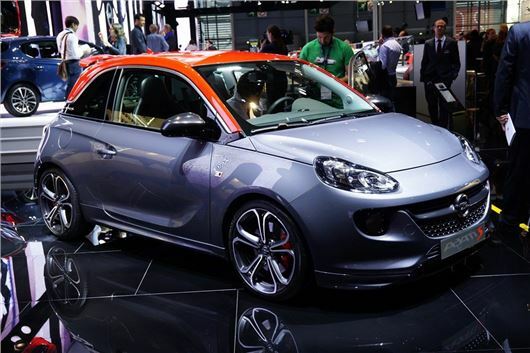 Vauxhall has revealed the 150PS Adam S at the 2014 Paris Motor Show. Order books for the car open in January 2015 and prices should be around £15,000. The hot version of Vauxhall’s upmarket hatchback is powered by a 1.4-litre turbocharged petrol engine producing 220Nm of torque, resulting in a 0-62mph sprint time of 8.2 seconds and a 124mph top speed. Official economy is 44.1mpg and emissions are 149g/km. Externally the Adam S gets more aggressive styling, with a roof spoiler, lip spoiler and unique bumpers, plus a ‘Red ‘n’ Roll’ roof colour option unique to the S. There are larger VXR brakes and 17- or 18-inch alloy wheels. In the cabin there are Recaro seats plus a good level of standard equipment including a seven-inch touch screen system with USB and Bluetooth connectivity. The cabin sports red details, while buyers can specify leather upholstery in black and red.